So you've decided to use disposable diapers but are confused about which one to choose? We were too so we decided to do a comparison and share our results! 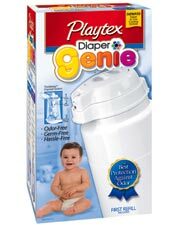 The Playtex Diaper Genie was the hands down our favorite! Why you ask? Because even though you must buy the blue Diaper Genie refills, its system of twisting the diaper (they call it the Twistaway System) leaves no room for odors. It has a childproof safety lid, holds up to 25 medium-sized diapers and is virtually odorless. We also tried the Cosco Diaper Nanny and the Baby Trend Diaper Champ but it just didn't seem odorless to us. The nice thing about the Diaper Champ is that it also holds cloth diapers and you don't have to buy its refill bags (you can use any plastic bag) while the Diaper Nanny is much larger and you must step on a pedal and the lid will lift (not a good thing!). Click here to check out the Playtex Diaper Genie disposable diaper system.